I've seen paperdolls before, of course, but these go above and beyond. 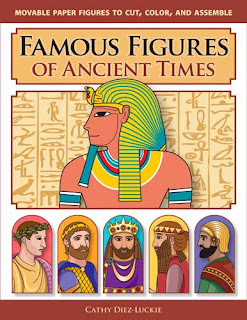 Famous Figures of Ancient Times : Movable Paper Figures to Cut, Color, and Assemble will buy you the time you need to share a story from days gone by while your children are busy cutting, coloring and putting together figures from the past. This is basically a hands-on activity book which is designed to attract children to learning more about the people who shaped the world as we know it. It is not a history book, although it does have a short blurb on the historical figures presented. Instead, it is a hefty book made of thick, stury pages of figures for children to cut out, color if they desire, and put together using mini brads or fasteners. This book includes the following figures for play: Narmer, Khufu, Sargon the Great, Hammurabi, Moses, King David, Ashurbanipal, Nebuchadnezzar II, Cyrus the Great, A Greek Hoplite, Qin Shi Huangdi, Aristotle, Alexander the Great, Hannibal, Hannibal's Elephant (oh yes! ),Julius Caesar, Casesar Augustus, Jesus, COnstantine, and Augustine. There are two copies of figures per book. One is already colored and illustrated and the other is blank so that the child can be creative on their own. This book is both a Dr. Toy winner and it has also received the Independent Publisher Book Award. You can find out more information about it by visiting http://www.figuresinmotion.com/. They also have a history club for children to join which I think is a pretty cool thing. Anythign that draws children into learning more about their past is worth some attention as far as I'm concerned. Again, they aren't history books but merely supplements to the main lesson, allowing children to act out the stories for themselves and essentially "travel through time" with a hands-on and creative activity. Interesting idea . . . I think I rather like it! WOW! Sounds like a great IDEA! Once my kido(s) get older I'll have to look into that for a fun history project! This is a very creative way for kids to interact with Bible characters and hide the Word in their hearts. I loved anything hands on when I was little. This sounds like a great interactive tool to get kids more interested in history. I love that it's not a history book but lets kids instead play with history and become familiar with it in a light, fun, and easy way.